Bronchitis is an inflammation of the bronchial tubes, those being the air passages that extend from the windpipe into the lungs. The inflammation may be caused by a virus, bacteria, smoking or the inhalation of chemical pollutants or dust. When the cells of the bronchial–lining tissue are irritated beyond a certain point, the tiny hairs (cilia) within them, which normally trap and eliminate pollutants, stop functioning. Consequently, the air passages become clogged by debris and mucous and irritation increases. In response, a heavy secretion of mucus develops, which causes the characteristic cough of bronchitis. It may be either acute or chronic. Bronchitis often follows a common cold or any infection of the nose and throat. Bronchitis – an inflammation of the bronchial tubes may be caused by smoking, air pollution and/or viral/bacterial infections. Complications of a cold or flu may lead to acute bronchitis, which can be treated with bed rest and by drinking plenty of fluids and staying indoors in damp, cold weather. 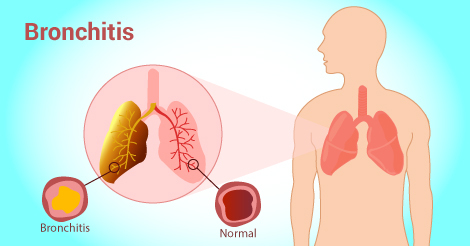 Suffering from a series of acute bronchitis attacks, smoking heavily or inhaling contaminated air for prolonged periods may result in chronic bronchitis. Since chronic bronchitis can be life–threatening, it should receive professional medical attention, no matter what its underlying cause.